The thrill of reaching a summit cross in high altitude with a short and easy panoramic walk is priceless. This trail is really suitable for everybody! This stunning walk starts at the mountain hut Rifugio Lagazuoi (2752 m) which can be reached by cable car from Falzarego pass. 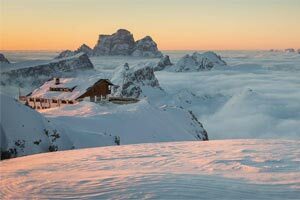 From the cross on the summit of Mount Lagazuoi (2778 m) you will enjoy unobstructed panoramic views and admire the most famous Dolomite peaks, among others the triumvirate of the Tofane and the Marmolada glacier. The path is very wide and easy to walk, even in a wheelchair and with a baby carriage. However, it has no safety devices: don't forget that you are in the high mountains, use common sense! A good windbreaker always belongs into your pack. Walk up and back on the same path. This path was realized by the Austrian Alpine Troops "Kaiserjäger" during WW1, restored by the ANA (Associazione Nazionale Alpini) branch of Treviso and inaugurated in 2008. The summit cross rises up just 775 meters from the top station of the cable car Lagazuoi. The path leading up to the summit has the following characteristics: • difference in altitude to the cable car: 38 m. • average gradient: 4.9% • maximum gradient: 10% • average width of the path: 1.50 m.